For questions about pricing and how the cakes are paid for, go to Pricing and Payment. For questions about how to contact Art Eats Bakery and our hours of operation, go to Contact Us /About Us. For any interns interested in being a part of the bakery, visit Intern learning program. To see all of the flavors and cakes we offer, visit Flavors. Q: How can I get a quote without coming into the bakery? A: You can email us photos, ideas, designs, date needed and let us know what you are looking for and how many guests need to be served. Most cakes can be done in several sizes and different colors. We can change anything and can design a cake combining ideas. When calling to see if we can fit in a late order, ask if we can do your cake for your date, not how much notice do we need. Each week varies as to how busy we are and each cake needs different times for completion. Even if you are still coming in, this can be a good starting point. This will reduce the time for your appointment and give you time to consider all of the options. Basic prices are on the Pricing and payment page. Q: Why is there no walk in bakery at Art Eats Bakery? A: We do small batches to insure that the quality stays high. We use real butter for our cakes and butter creams. They should be enjoyed as fresh as possible. This bakery is part art studio. Some of the artist and wedding cakes require very long hours in just a couple of days and it is is best for us to devote our attention to them. Q: Do the cake details and designs ever take away from how good the cake will taste? A: Absolutely not. All of our cakes taste as great as they look. Our fresh, fine ingredients and recipes insure you and your guests will be thrilled with the moist delicious taste. Our cakes and icings are made with real butter and natural ingredients. Every detail we make is edible, unless discussed otherwise. Q: How do I know the decorating will be high quality? A: Our photos on our website are large close-up clear pictures so you can see every detail. They not professional pictures and lighting, but you can see the craftsmanship and care that goes into our designs. You can also come for a consultation and cake tasting. This way you can see our photo albums and display cakes. We have great reviews on google and other sites. Q: What are your most requested cakes? A: Rich vanilla cake with vanilla butter cream, strawberry with strawberry or amaretto, amaretto with vanilla or amaretto butter cream and fudge marble with vanilla or chocolate butter cream filling. A new flavor we have developed is also doing very well. It is butter rum cake and butter cream. Q: Why does your fondant taste so good? A: Because we make our own fondant fresh with great ingredients. We can make it in a lot of different flavors. Some flavorings will change the color and are not good for white or off white cakes. Q: Can I choose more then one flavor? A: Yes, with a 3 tier cake you may choose 2 flavors. With a 4 tier cake you may choose 3 flavors. If you are adding sheet cakes, they can be different flavors also. It is suggested that you limit wedding cakes to 2 flavors. It is difficult for the staff to help guests with too many choices and some may be unhappy that they didn't get some flavor that ran out. Q: How can I save money and still have a beautiful wedding cake when having a large wedding? A: You can have a smaller, great cake decorated the way you want, then have sheet cakes for more servings. The sheet cakes cost a lot less and are kept in the kitchen until you cut your main cake. They are plated and served at the same time and your guest do not know that it is not all the same cake. Q: Why use a commercial bakery when I can do it for cheaper out of my own home? A: We carry liability insurance, city business license and maintain a DHEC A rating for your safety and are in a commercial building. If someone at your event gets sick or there is some other problem with you cake, you can be sued. If something doesn't go right or they don't come through as promised, there is nothing you can do because the person you used wasn't insured or licensed. Q: When is a Groom's cake served? A: It was traditionally served after the rehersal dinner. Now a lot of people serve it at the reception. If it is a more elaborate cake, more people will see it at the reception. Q: Do the prices include fresh flowers? A: No. You will need to order flowers from your florist. You will get a better price and they will be sure to match your other flowers. We do provide our own hancrafted sugar or chocolate flowers. You may also use silk. Q: How far ahead of time do I need to order my wedding cake? A: As soon as possible. May through July can fill up quickly and September through November have become just as popular in the Upstate. I would allow at least 3-6 months We have bookings a year and 6 months in advance. We will do our best to work late orders in, but sometimes it is impossible. We will not take more orders than we can fill in the quality that we always do. Q: After picking up my cake, do I need to keep it cold? A: If it will be served whithin 12 hours, you can keep it at a cool room temperture. If it will be refrigerated, take it out 2-3 hours before serving. it should not be served cold. The flavor and texture of a cake is best at room temperature. It should be cut with a sharp knife. The cake server is just for lifting the pieces after they are cut and will mash the cake instead of cutting it clean. Q: If I am picking up my cake, are there any special instructions? A: You need a flat place on the floorboard for the cake. A van or suv would be best. Make sure there is room to put it in and take it out safely. Do not have any items that will move and crush your cake. Many of our cakes will not fit in a regular cake box and will be in a larger packing box. We will provide a non-slip mat for it to sit on. Do not leave a cake in the car with the car off in warm weather. Real butter cream get soft or melted very quickly. We can provide a cold packs box for $15 that will keep it cold for a few hours. Please ask if in doubt. Q: Do you do cake delivery? A: Yes. The prices vary depending on how far we need to travel. The minimum is $50. We are located in Greenville, SC and it is our only location. 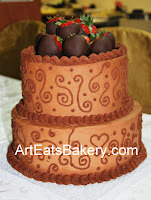 Q: Do you ship cakes from Art Eats Bakery? A: No, we do not. We do delivery or pick up. Delivery charges vary based on distance and set up that needs to been done upon arrival. 3 hours is our maximum travel time one way. Q: What do I need to bring with me for the consultation? A: Any thing you have pertaining to your event: Invitations, ribbons, photos of the venue, photos of attire, photos of cakes you like (even if it is just one part of the cake that suits you) and anything else that will give us some visual idea of what you like. We can then design the perfect unique cake for you. Please let us know how many people you will be bringing with you, so we can have cake ready for you to sample (5 is the maximum). We do our appointments on Tuesday and Wednesday. These can be evening appoinments. During December, January and February we can somtimes fit in an appointment later in the week.